I respect the fact that wasps can sting when threatened or disturbed. But I also respect the fact that they are beneficial. Every time I’ve been stung by wasps, I either accidentally disturbed a nest that I didn’t know was there or I intentionally disturbed the nest and paid the price. Paper wasps are common in Florida. 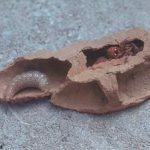 They frequently construct and attach their paper-like nests to building eaves or the ceilings of porches. The adults seek out caterpillars, which they sting and paralyze. They then take the caterpillars back to their nest and place them in individual cells as food for the developing larvae. I’ve witnessed the paper wasp as it stings and carries away a caterpillar from my vegetable garden. They are busy insects and are doing us gardeners a favor by reducing the population of caterpillars in our landscapes and gardens. There are other beneficial wasps in Florida. 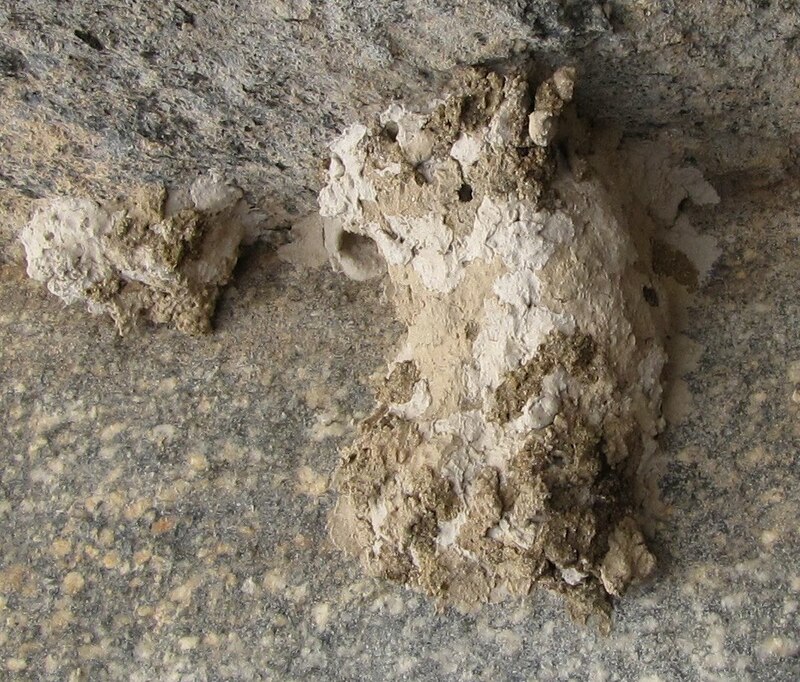 Mud daubers, for example, build their mud-like nests on the sides of buildings close to human activity. The mud dauber is not as aggressive as the paper wasp. It rarely stings people. It stings and paralyzes spiders. 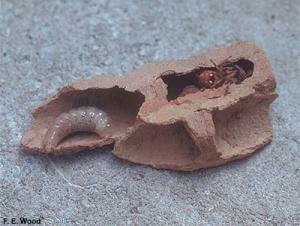 The mud dauber lays an egg on each paralyzed spider and seals it inside a chamber in its earthen nest. Upon hatching, the wasp larva feeds on the body of the spider. An emergence hole is made as the young wasp leaves the mud nest. 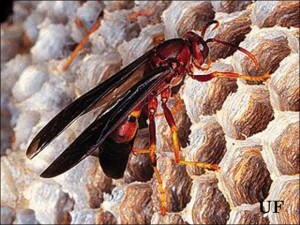 It may not be wise to tolerate all wasp species living in close proximity to your home. Even though yellow jackets, a type of wasp, could be considered beneficial, they are too aggressive and too likely to repeatedly sting to have as close neighbors. I also would be concerned with any type of wasp or bee nest existing in close proximity to individuals with a known allergy to insect stings. Just because an insect has the ability to sting, it’s not all bad. Wasps can serve a beneficial purpose. But you’ll have to decide for yourself how close to you they can build their nests. The front porch may be too close. Summertime is bug time in the Florid Panhandle. The weather has provided enough rain for the bugs which depend on a supply of foliage and the temperatures have been ideal for a population explosion. Stink bugs, leaf-footed bugs, grasshoppers, all sizes and colors of caterpillars and many more have been enjoying the lush and plentiful dining options. More than one Panhandle homeowner or gardener has been plagued by the sudden appearance of a hoard of hungry nuisances which are eyeing the menu choices at residences. Fortunately, nature has a way of eventually balancing all situations when left to its own devices. With the increase of the plant eaters comes a surge in those insects which restrain the excess population. One of the most easily recognized predator insects is the praying mantis. This beneficial insect is actually a family with multiple members, some of which have been introduced to Florida. While there are over 2400 mantis members worldwide, Florida is home to eleven. Two of those exotics have been introduced from other regions, but considered non- invasive. Mantises are thought to have evolved during the Cretaceous period about 100 million years ago, possibly from a predatory cockroach with similar front legs. Their closest surviving insect relatives are cockroaches and termites, both of which they will consume if given the opportunity. Like many insects, the mantis is equipped with a tough, durable exoskeleton which provides a basis for successful close quarter combat and meal procurement. These hunters have three other advantages which create a severe vulnerability in their prey’s defense and potential for surviving a mantis encounter. The mantis is an ambush predator which will lay in wait for the victim/meal to deliver itself. The mantis has the instinctive ability to identify and hide in areas with high amounts of prey species traffic. This insect is a master at stealth and camouflage. The creature’s coloration and linear shape allow it to blend into the earth tones of many settings. To complement its ability to conceal itself in plain sight, the mantis can hold perfectly still and patiently wait for the oblivious bug to bumble into sticking range. At that precise moment, the mantis is a blur of lethal motion. The mantis’ forelimbs are a set of deadly spiked vices used to immobilize and secure its target. It extends these spiny levers forward in a raised position which appears as though it is in a mealtime prayer, hence its name. The kill technique is to impale and restrain the victim with a single stroke of the forelimbs while holding the victim securely to the mantis’ body. On occasion the attempt fails and the mantis has to apply a more direct approach. This insect’s beak is designed for slicing and tearing its victim’s body. Its jaw muscles provide the power to effectively employ this tool. Depending on its stage of live, the mantis will eat a wide variety of creatures. Early stage mantises will eat little flies and other tiny insect (including its siblings), but at maturity they will take on small reptiles and amphibians along with a variety of destructive insects. Female mantises will even consume their prospective mates. 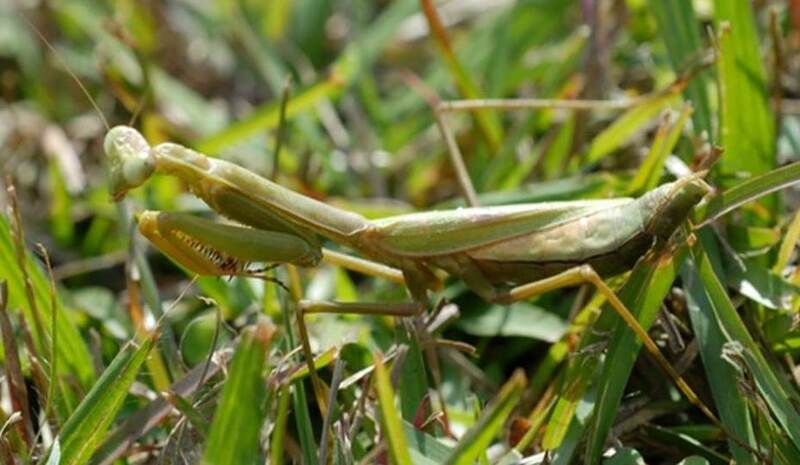 Despite its vicious and cannibalistic nature, the praying mantis is the answer to many gardeners’ prayers. To learn more about praying mantises and other beneficial insects, check out this EDIS site with many articles on various species of beneficial insects. Basil is a favorite plant in the summer herb garden and an absolute must for those who enjoy fresh leaves for a sandwich or delicious homemade pesto. 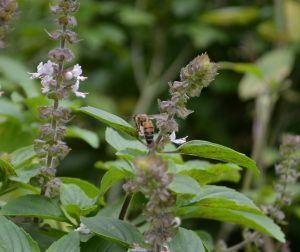 While we grow basils as a food enhancer, an added benefit is that those basil selections that form flowers are very attractive to pollinators. If you would rather not let your favorite basil form flowers, consider adding a specific species that is grown more for its attractiveness to pollinators than its culinary uses. 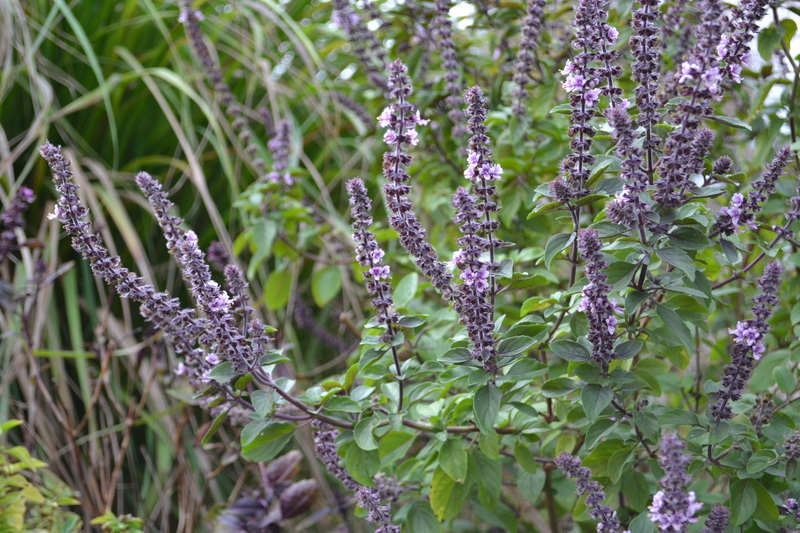 African blue basil is a hybrid of two basils that has inherited a camphor flavor from one of its parents. 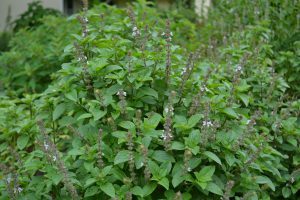 Although edible, the flavor may not be appealing to those who are familiar with more traditional basil flavors. Plants produce abundant flowers that are pink with a dark purple base, although flowers are sterile so no seeds will be formed. 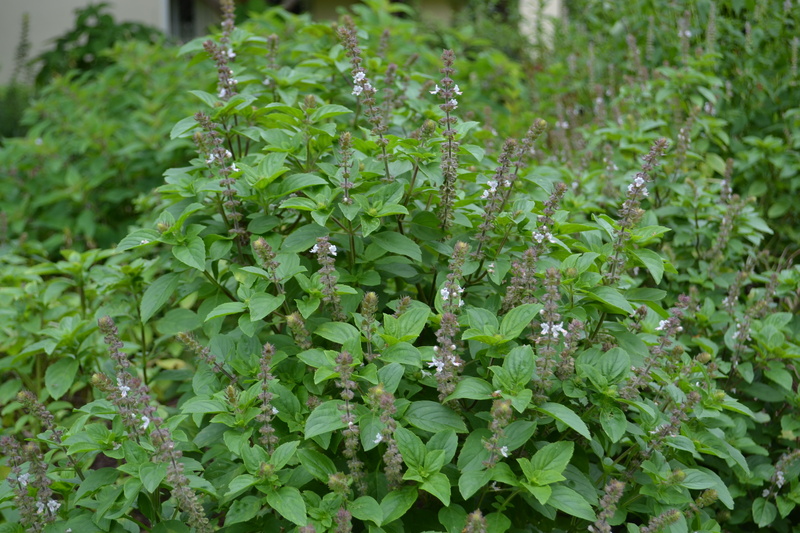 If you want more African blue basil, you must purchase transplants or start your own from cuttings off the main plants. 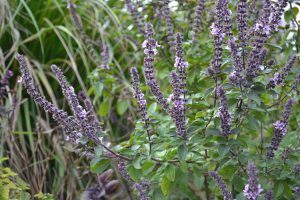 Like other basils, African blue basil does like soils amended with composts that are well-drained. Plants thrive in full sun and will form rounded mounds that will be much larger than more culinary basils, up to five feet in some gardens. Plants do form woody stems and although frost tender, some plants may return in the spring in more protected areas. Although some edible gardeners may not want to allow space for a basil that they will not use in the kitchen, the amount of pollinator activity on this selection makes it a benefit to any edible garden for all the frost-free months. With all the media discussion of “bad” insects, like mosquitoes, many of the good guys are forgotten. 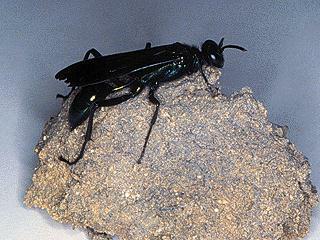 One that has been very active this summer is the blue mud dauber, Chalybion californicum. 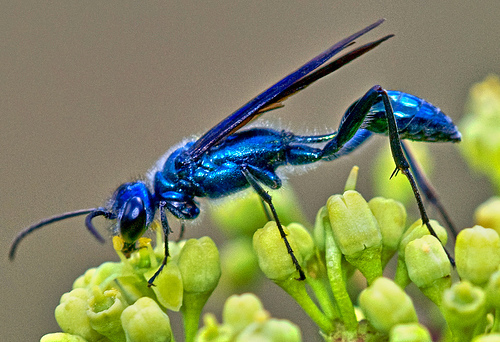 These wasps are metallic blue, blue-green or blackish in color with very short narrow waists. During the summer, female blue mud daubers build nests by bringing water to abandoned mud nests made by other species of mud dauber wasps. They form new mud chambers, stock them with paralyzed spiders and a single egg, then seal the chambers with more mud. Their offspring stay in the chamber, feeding on the spiders, and then pupate in a thin silk cocoon. They spend the winter in the nest, emerging the following spring as adults. Blue mud daubers are solitary wasps and not known to be aggressive. When the females have carried water to an old black and yellow mud dauber’s nest, she softens it and remolds it to her needs. The result is a very lumpy version of the originally smooth nest. Next she must fill the nest with food for her future offspring. The blue mud dauber prays on spiders. 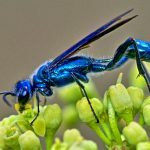 If orb weavers, lynx or crab spiders are plentiful, the blue mud dauber is able to land on their web without getting entangled and pluck the web to simulate an insect in distress. When the spider rushes to capture its prey, the poor arachnid becomes the victim of the wasp’s paralyzing sting and is quickly flown to the mud nest. 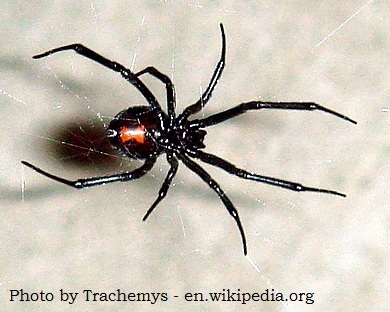 However, the preferred host of the blue mud dauber is the southern black widow. Even without the elaborate web game, this wasp can control a dangerous nuisance. Once at the nest with her spider victim, the blue mud dauber stores the paralyzed arachnid at the bottom of a mud cell and lays a single egg onto its body. When the wasp larva hatches it consumes the remaining body of the spider. With a full belly, the mature larva spins a papery silken cocoon within the mud nest and begins to pupate. The following spring an adult wasp chews a round hole in the end of the mud cell and exits it’s winter home. So, rather than having to cover yourself in DEET just to spend the evening on the patio, brave the heat (with water bottle in hand, of course) and spend the daytime hours watching the blue mud daubers prepare their nest for next year’s young. 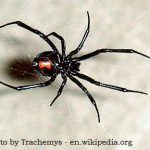 Maybe the media will pick up on wasp that are reducing black widow populations, rather than the dangers of mosquitoes. Scales on a Chinese Elm. 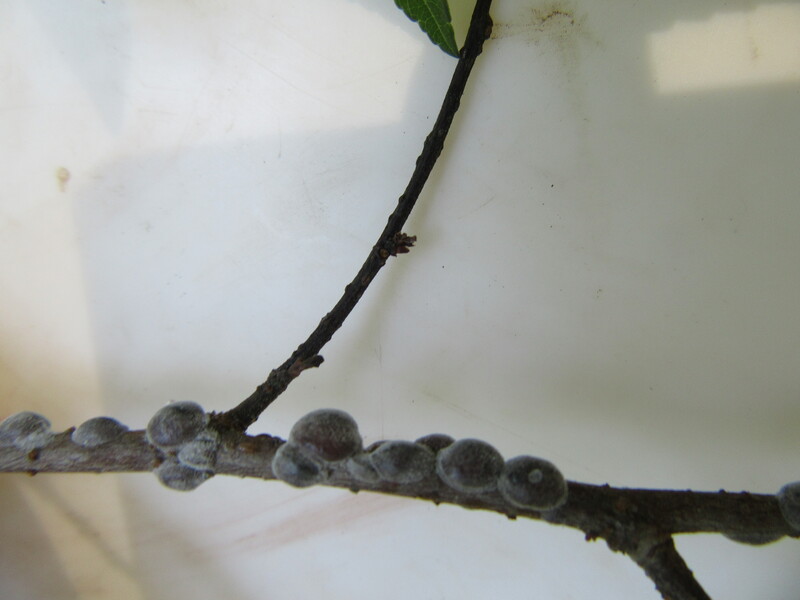 Last week as I was basking in the shade of the Chinese Elms (Ulmus parvifolia) in my yard, I noticed some strange lumps on the twigs. Upon further investigation, I realized the “lumps” were scales. Scale insects are serious pests of a number of ornamental plants. Here in Florida there are 13 different families of scales with the most common being armored scales, soft scales, and mealybugs. Scales have piercing-sucking mouthparts which they use to siphon fluids from the leaves, stems, and sometimes roots of many ornamental plants. 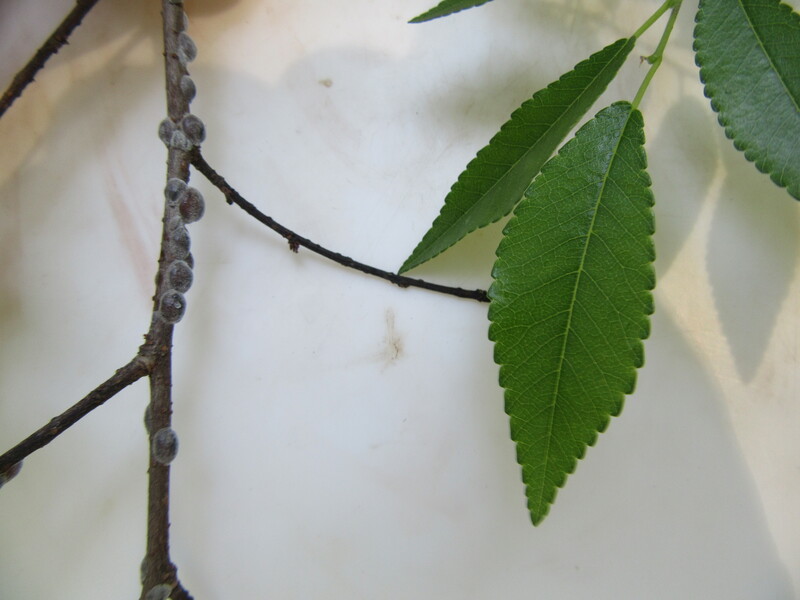 Heavy infestations cause extensive leaf yellowing, premature leaf drop, branch dieback, and eventually plant death. The life cycle of a scale begins with eggs being laid beneath wax coverings or beneath the adult female. Eggs typically hatch in 1 to 3 weeks. The newly hatched nymphs, called crawlers, move around a plant until they find a spot to feed. 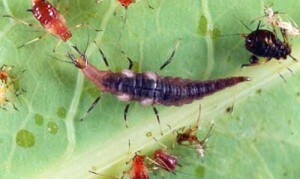 Once a feeding site is located, their piercing sucking mouthparts are inserted into the plant and the crawlers begin to feed and grow. The males of many scale species develop wings as adults and fly to other plants to reproduce. Armored scales get their armor by secreting a waxy covering over their bodies that is not attached. The scale lives under this covering and uses it as a protection to feed under. Armored scales can be almost any color or shape and range anywhere from 1/16 to 1/8 inch in diameter. For females, these shapes range from circular to oval to long and slender. The males typically have coverings that are more elongate and smaller than the females. As adults, the males are tiny, winged, gnat-like insects and are rarely seen. Similar to armored scales, soft scales secrete a waxy covering, but it is attached to their bodies. Soft scales can be a number of colors, shapes, and sizes and range anywhere from 1/8 to 1/2 inch in diameter. Their shapes vary from spherical to nearly flat. Mealybugs are soft-bodied insects that possess a covering of flocculent, white, waxy filaments. They are about 1/8 inch in length and usually pinkish or yellowish in color. 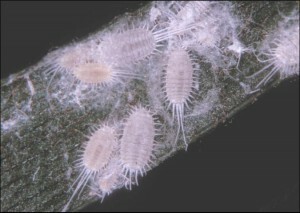 Mealybugs have piercing-sucking mouthparts which they use to siphon fluids from the leaves, stems, and sometimes roots of many ornamental plants. Mealybug damage produces discolored, wilted, and deformed leaves. Cultural Control – Plant inspection prior to purchase or installation is the first line of defense against a scale or mealybug population. Make sure to inspect the undersides of leaves and plant stems. Infested sections of plants can be pruned and plant material should be cleaned from the planting area and discarded. Also, you can increase air flow and decrease humidity by proper installation and pruning. 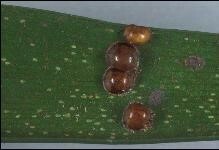 Over-fertilizing can also increase pest populations. Larva of a brown lacewing. Credits: Lyle Buss, University of Florida. 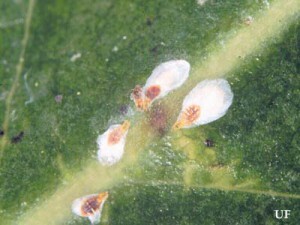 Biological Control – Predators, such as ladybugs and green lacewings, are usually present in large enough numbers to suppress scales and mealybugs to a desirable threshold. However, broad-spectrum insecticides and bad weather can reduce predator numbers. Look for signs of predation by inspecting dead scales for jagged holes in their waxy coatings. If predation signs are present, use more selective chemical controls and oils as opposed to broad-spectrum products. Chemical Control – Timing is everything when it comes to managing scale and mealybug insects. Crawler activity is more pronounced with the flush of new plant growth in the spring. Before application, prune infested plant parts off first to promote greater penetration of insecticides into the foliage. Contact products (acephate, bifenthrin, carbaryl, etc.) must be applied to inhibit the crawler stages of these insects and systemic products (acetamiprid, imidacloprid, thiamethoxam, etc.) can be used on the sessile growth stage. Plants should be sprayed thoroughly to the point of drip or “run off” from leaves, twigs, and stems. Repeated applications may still be necessary even if the timing is right, as crawler populations are often large and crawlers like to hide under old waxy scales. Systemic drenches are also a viable option. With good spray coverage, horticultural oils can kill scales at all stages of growth. Refer to the product label for phytotoxicity and temperature guidelines. 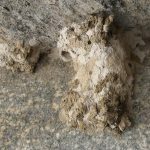 Even after successful treatment, the outer coatings of the scales may remain on the plant material for weeks, which can be unsightly. The best way to determine if scales are dead is to squeeze them. They will be dry when squeezed if they are dead and they will ooze liquids if they are living (they were at least alive to the point of being squashed).